This blessed Holy Spirit has all the characteristics of a comforter. He is so pure and holy that He cannot deceive; He is called the “the Spirit of truth” (John 14:17). If He says your sins are forgiven, you can believe Him; He will not flatter. If it were not so He would have told you, for He can chide as well as comfort – He can convince of sin as well as of righteousness. And the Spirit of God is so wise that He cannot be deceived; He never knocks at the wrong door nor delivers messages to the wrong person, but knows the exact purpose which the heart of God holds for each person on earth. “The Spirit searcheth all things, yea, the deep things of God” (1 Corinthians 2:10). These “deep things of God” which the apostle mentions are God’s counsels of love which lie deep in His heart until the Spirit draws them out and shows them to men and women. And He also knows perfectly the frame of man’s heart. It would be strange if the cabinet maker did not know every secret compartment in the cabinet. Despite their long study, neither man nor the devil have anything even approaching a full knowledge of that little world, the microcosm of man’s soul. But as in everything else, God knows this field perfectly and cannot be deceived. In a word, God’s Spirit is so irresistible that no one can stand against the power of His peace. For example, the pardon Nathan took to David was not all that he had hoped for; so David begged the Comforter to ease his pain. He went on his knees and prayed hard to have his lost joy restored and his softened heart established by the free Spirit of God. You might baffle man, and though your own melancholy manipulation, even evade the truths which Christians bring for comfort; but when the Holy Spirit Himself comes, all disputes will end. Satan cannot pull rank or his false logic on Him. Confusion vanishes and our fears with it, as darkness disappears before the sun. – Taken from The Christian in Complete Armour, August 31. Edited by James S. Bell, Jr. and published by Moody Publishers. Expository Thoughts on the Gospels: Luke volume 2 , [Carlisle, PA: Banner of Truth, 1998], 320. About a week ago Kim and I went out to run some errands, go shopping and stop at a coffee shop. We wanted to try one that we had never been too so we went to La Vida Java. It is located in Westport Village, 1301 Herr Lane, Suite 110, in Louisville. It is easy to find and there are a lot of shops and restaurants around it. We went there on Wednesday morning and it was not too crowded. We like to look around a shop and order small cups of their daily brew. 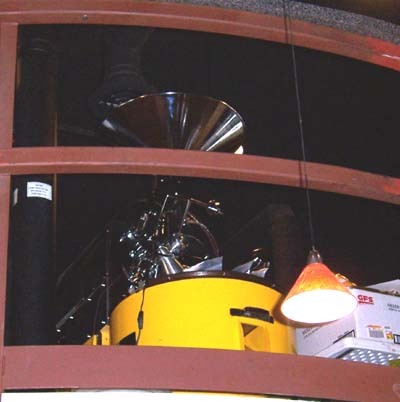 The two coffees we chose were a dark roasted Ethiopian and medium roasted Costa Miel Blend. The owner was working that morning and he made Costa Miel fresh while we waited. He is very personable and we had a good conversation with him. He answered all of our questions while we waited. As other customers came in he greeted those he knew by name and asked if they wanted their regular. I visited their website and found the Ethiopian Yirgacheffe described as medium dark and bold and as intense as its name with aromas ranging from fruity and flowery enzymatics to exotic fresh leathers. Its smoky flavor follows suit displaying a fruity tart earthiness with a dry clean finish. 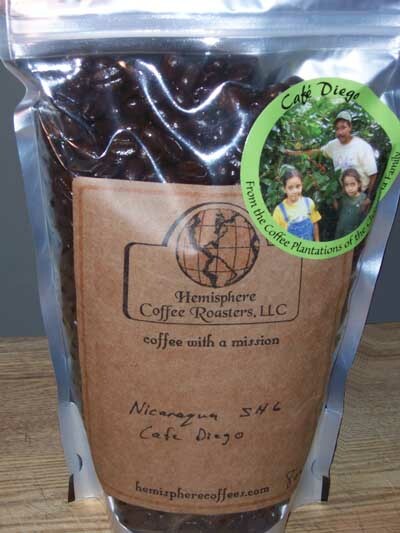 The Costa Miel (Honey Coast) Blend is medium and mild and is a breakfast blend which is comprised of three South and Central American beans. The chocolaty, creamy and sweet taste lends itself to a caramel nutty and smooth finish, hence its name. We were looking forward to tasting these coffees. The Ethiopian was good and had a nice fruitiness. It was not over roasted which is a good thing. The Costa Miel was excellent. It was naturally sweet and smooth. When we left the shop we went to Whole Foods and left the coffees in the car. We came out and both were cooled off. We liked the flavor profile of both as they cooled and thought the Costa Miel would make a great iced coffee. It was a very enjoyable. 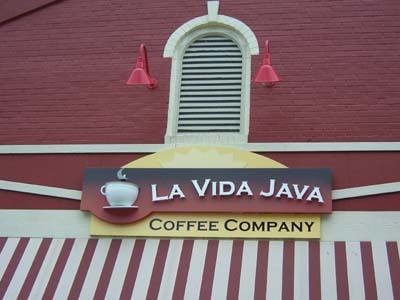 We would recommend a visit to La Vida Java (www.lavidajava.com).Their motto is “Live Life. Have Fun. Drink Coffee!” Even if you are driving through Louisville on a trip and want to stop for good coffee, this place would be worth the stop. The friendliness of the owner and the quality of the coffee made this an enjoyable date. Until next time, remember to stop and enjoy the coffee and conversation. This hymn was written by John H. Stockton and is sung in 4/4 time. 1. Come, every soul by sin oppressed – There’s mercy with the Lord, And He will surely give you rest By trusting in His Word. (Refrain) Only trust Him; only trust Him. Only trust Him now. He will save you; He will save you. He will save you now. 2. For Jesus shed His precious blood, Rich blessings to bestow; Plunge now into the crimson flood That washes white as snow. 3. Yes, Jesus is the Truth, the Way, That leads you into rest; Believe in Him without delay And you are fully blest. Ask anyone who has repented of their sins toward God and turned in faith to the Lord Jesus Christ (Acts 20:21) how they now feel and you will probably get a lot of different answers. Ask the saved, sanctified child of the Most High God how he feels singing this song and he will probably tell you that he can’t sing it loud enough or with enough feeling to express the joy that comes from being in Christ. We can argue about which comes first in the mind and heart of an individual, faith or regeneration? Or does regeneration come first then faith? What should be in the heart, mind, soul and voice of every blood purchased, redeemed child of God is joy for the forgiveness of sin and the blessing of eternal life with Christ in the presence of God (Rom. 5:1-5). Then there should be a desire that others (sinners) would come to know God’s love and mercy that only comes through the forgiveness of sin. There is only one way to God. That way involves repentance of sin and faith in the Lord Jesus Christ. Trust that He loves you and trust that He has the power to forgive you. Only trust Him now. God chose to give this treasure of reconciliation to humble us, so our haughtiness might bow and God could be exalted in our day of salvation. “The bread of God is he which cometh down from heaven, and giveth life unto the world” (John 6:33). And notice hwy God chose that method to feed His children in the wilderness: “Who fed thee in the wilderness with manna, which thy fathers knew not, that he might humble thee”(Deuteronomy 8:16). Let us examine this humbling process more carefully. Naturally we assume that the Israelites would have become wise as well as humble when God Himself fed them with “angels food” (Psalm 78:25). Yet man is proud and wants to be his own provider; he does not enjoy a meal sent in by charity, at another’s expense, nearly so much as he does food which he earned himself. This pride made the children of Israel wish for the onions of their Egyptian gardens – inferior food but food bought with their own money instead of brought to them by God. God’s reconciliation to sinners was aimed at a more perfect union than He had with Adam. God would never have allowed His first workmanship to be so scarred by sin if He had not planned to build a more magnificent structure out of its ruins. Because He intended to print man’s happiness in the second edition with a more perfect type than the first, He used Christ as the only fit instrument to accomplish this design: “I am come that they might have life, and that they might have it more abundantly” (John 10:10). He did not come to give the dead and damned a bare peace – naked life – but a more abundant life than man ever had before sin separated him from God. – Taken from The Christian in Complete Armour, August 19. Edited by James S. Bell, Jr. Moody Publishers Edition, 1994. Have you fully surrendered to the Lord? Typically this song has been used as an invitation to come forward to the altar at the close of a service. But I think it could be used during your morning devotional reading as a prayer of praise and surrender. Maybe submission might be a word some would rather use instead of surrender. Regardless of the word you choose, you must surrender or submit your life to Almighty God. He is GOD and there is no other. 1. Have Thine own way, Lord! Have Thine own way! Thou art the Potter; I am the clay. Mold me and make me after Thy will, While I am waiting, yielded and still. 2. Have Thine own way, Lord! Have Thine own way! Search me and try me, Master, today. Whiter than snow, Lord, wash me just now, As in Thy presence humbly I bow. 3. Have Thine own way, Lord! Have Thine own way! Wounded and weary, help me, I pray. Power all power surely is Thine! Touch me and heal me, Savior divine! 4. Have Thine own way, Lord! Have Thine own way! Hold o’er my being absolute sway! Fill with Thy Spirit till all shall see Christ only, always living in me! If we hear insignificant news we will probably forget it. But if it is both important and very good, it causes rejoicing. The angel of the Lord said, “I bring you good tidings of great joy” (Luke 2:10). It has to be great joy because it is all joy; the Lord Christ has brought news of such fullness that He left nothing for anyone else to add. If you think something might be missing from the Gospel you must look higher than God, for He gives Himself though Christ to believers in the covenant of grace. We are fully persuaded the apostle Paul’s argument will hold: “All things are yours; and ye are Christ’s; and Christ is God’s” (1 Corinthians 3:22-23). The Gospel places our vessels close to the fountain of goodness itself; and surely we must have all if we are united to the One who has everything. Can any good news come to glorified saints which heaven does not give them? We have proof of that glory in the Word: “Jesus Christ, who hath abolished death, and hath brought life and immortality to light through the gospel” (2 Timothy 1:10). The sun in the sky hides heaven from us while it shows the earth to us! But the Gospel enlightens both at once – godliness has the “promise of life that now is, and of that which is to come” (1 Timothy 4:8). The audience must have a personal interest before an announcement can be good news. While we can be happy to hear about something good happening to another person, it affects us more when it is poured directly into our own hearts. For example, a sick man does not feel the joy of another’s recovery as strongly as he would his own. The Gospel does not report what God has done for angels but for us. “Unto you,” the angel said, “is born …… a Saviour, which is Christ the Lord” (Luke 2:11). If angels rejoiced for our happiness, surely our benefit gives even deeper reason to be glad. – Taken from The Christian in Complete Armour, August 11. Edited by James S. Bell, Jr. Moody Publishers edition, 1994. Christian reader, I do hope that you are encouraged to read your Bible daily and to pray daily. I hope that your prayers are not just for yourself or your family but that you intercede for other people that you know personally and for people that you don’t know personally. I also hope that you supplement your Bible reading and prayer with good devotional reading and a personal study of the Bible to learn truth to apply to your life that you may consistently “grow in the grace and knowledge of the Lord Jesus Christ” (2 Peter 3:18) and bring God glory. (14)This is the confidence we have in approaching God: that if we ask anything according to His will, He hears us. (15)And if we know that He hears us – whatever we ask – we know that we have what we asked of Him. Don’t forget to spend some time on Sunday mornings reading your Bible, praying and studying God’ Word. Sometimes Christians skip the discipline of devotion on Sunday mornings because they will be attending church. Don’t be like the average Christian. Spend that quality alone time with God and remember to pray (intercede) for your pastor, all the people who serve others at your church on Sunday mornings and for unsaved visitors to be invited and to attend your church. Pray that your church would be an example of God’s transforming power to your community. 1. Sweet hour of prayer, sweet hour of prayer, That calls me from a world of care, And bids me at my Father’s throne Make all my wants and wishes known: In seasons of distress and grief My soul has often found relief And oft escaped the tempter’s snare By they return, sweet hour of prayer. 2. Sweet hour of prayer, sweet hour of prayer, Thy wings shall my petition bear To Him whose truth and faithfulness Engage the waiting soul to bless: And since He bids me seek His face, Believe His Word, and trust His grace, I’ll cast on Him my every care And wait for thee, sweet hour of prayer. We enjoy drinking coffee with friends and getting to know one another better. We try to share all of the coffee we receive for reviewing with friends and co-workers. Sometimes we have friends over to drink coffee with and sometimes we give beans to them so they can brew it at home. We ask them to tell us how they liked the coffee after they have had it. So it was good to be able to have some friends over to share this Kenya AA Lenana from Stauf’s (www.staufs.com). 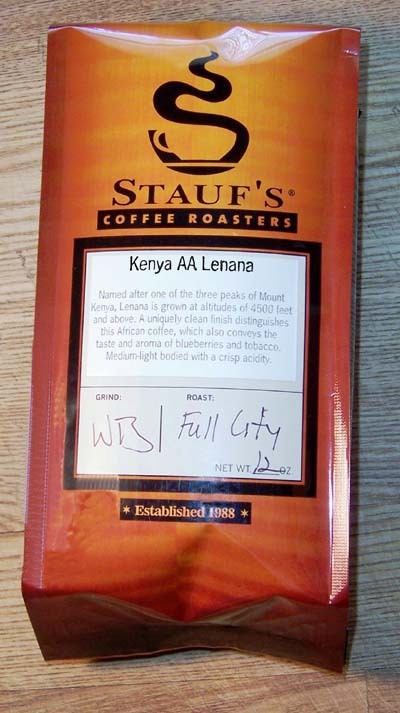 The Stauf’s Kenya AA Lenana is described as having a uniquely clean finish with the taste and aroma of blueberries and tobacco. It has a medium-light body and a crisp acidity. It came as a whole bean full city roast. It is named after one of the three peaks of Mount Kenya and is grown at altitudes of 4500 feet and above. We all thought the aroma in the bag was pretty good, a mix of fruit and smoke. We were looking forward to brewing it. We had two groups of friends over at different times and the first brewer choice for each was the Chemex coffee maker because they had never tried coffee brewed that way before. Two even drank their coffee black because they wanted to try a new coffee drinking experience. We thought it had a somewhat sweet, fruitlike flavor. It has a light body and a mildly crisp acidity with a good aftertaste. It went well with the fruit-topped cake we had for desert. Next we tried the French Press which seems to be the most common brewer that people get after the auto-drip. Here the aroma and flavor were stronger, but acidity is still mild. The body seemed more medium here, just a little bit heavier. Another sugar and cream user drank his cup black and enjoyed it. This is really an enjoyable cup of coffee in the press. Most of our friends just brew coffee in an auto-drip and they don’t own a grinder. 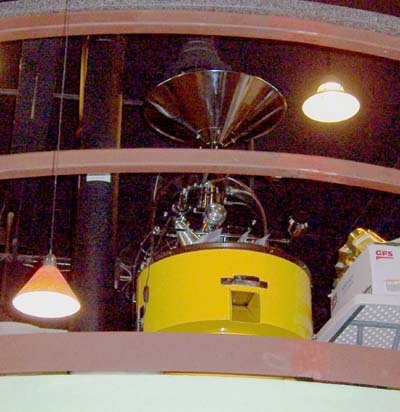 So we help them learn about grinding whole beans, different brewing methods and fresh roasted coffee. Usually they are surprised at how good fresh roasted coffee tastes, even the ones that think that “coffee is coffee.” It is funny to see the smile on their faces when they take that first sip of freshly ground and brewed coffee. From the auto-drip this Kenyan has a mild, naturally sweet flavor. The flavor doesn’t seem to last long in your mouth, but it is a good cup of coffee. 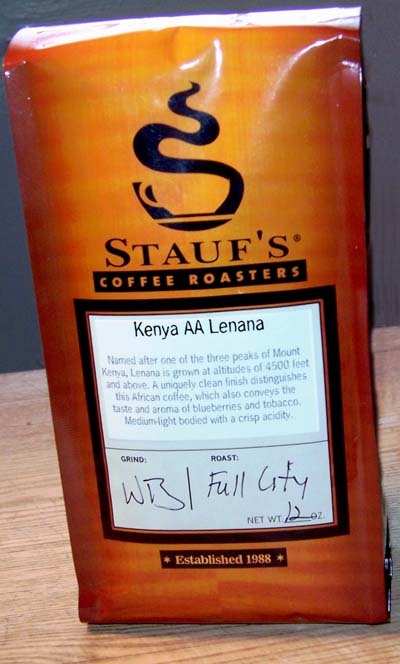 If you would like to try a good mild coffee, this Kenya AA Lenana from Stauf’s might be the one for you. We enjoyed good coffee, good food and good conversation. It was a good coffee brewing and drinking experience. We received this coffee for free and offer objective feedback. Until next time remember to stop and enjoy the coffee and conversation.